After several weeks away from flying aerobatics, I took the Extra 300L up for practice and to check out the new camera position at the left wingtip. Keen observers will note bobbles on the rolls and other flaws, but that’s why we practice. As you can see, it was a lovely day to fly over the desert southeast of Las Vegas. Here’s a quick demonstration of incipient spins from skidding and slipping turns, plus a classic spin from a slow-deceleration stall. Finally, I show an inverted spin. This video features views from both the left wingtip and the pilot’s perspective. For more information, see my stall/spin page at BruceAir.com. Highlights from a recent practice flight in the Extra 300L out of its winter base, Boulder City, NV (KBVU). This video features views from the left wingtip of the aircraft, and I tried to announce and describe most maneuvers from the cockpit. I show each of the outside-snap series from knife-edge twice, once from the wingtip, then from the cockpit. That maneuver is not quite a complete tumble, but it’s a good ride. As the latest IFR low-altitude en route charts show, the VOR (at present still depicted on the charts to help pilots become familiar with the new routes) has been replaced by a five-letter waypoint, LAAYK. 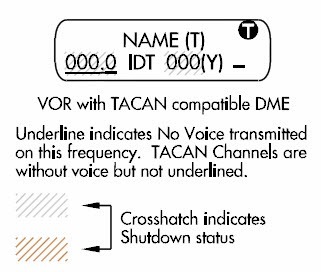 Note that the frequency for the VOR (110.8) is now shaded to indicate that the facility has been shut down, as described on p. 54 of the Aeronautical Chart User’s Guide. A wider view of the area shows that several victor airways or segments of airways have been replaced with T-routes, depicted in blue on charts published by the FAA. T-routes and their associated G (GPS-based) MEAs are described in AIM 5−3−4. Airways and Route Systems and in “Area Naviation (RNAV) ‘T’ Route System” on page 56 of the Aeronautical Chart User’s Guide (12th edition). You can expect similar changes as more VORs are shut down over the next several years, leaving what the FAA calls the Minimum Operational Network. That plan at present calls for all VORs in the mountainous regions (essentially the western U.S.) to remain online, while many VORs elsewhere in the country are decommissioned. FAA AeroNav Products has published a new edition of the Aeronautical Chart User’s Guide. You can download the free PDF version of the guide from the FAA website, here. This publication includes explanations of all symbology used on World Aeronautical Charts, Sectional Aeronautical Charts, Terminal Area Charts, Flyway Planning Charts, Helicopter Route Charts, Enroute Low Altitude Charts, Enroute High Altitude Charts, Area Charts, Oceanic Route Charts, Standard Terminal Arrival Routes, Standard Instrument Departures, Instrument Approach Procedures. This guide is a great reference if, like many pilots, you use an app like ForeFlight or WingX Pro on an iOS device. Most aviation apps display aviation charts published by the FAA (Jeppesen’s Mobile FlightDeck being the major exception). Deborah Fallows, a linguist who is flying around the U.S. in a small general aviation aircraft with her journalist husband James Fallows, has posted another installment in her blog: ITAWT ITAWA PUDYE TTATT: The Secret Language of the Skies. It’s a fun read. Arguments about who can log what type of flying time generate more discussion and misinformation than any other topic in aviation. If you wonder about who can log pilot-in-command time (PIC) and second-in-command time (SIC), and if you don’t understand the key distinction between acting as PIC as logging PIC time, I strongly recommend visiting Logbooks and Logging Time at AOPA (you may need to be an AOPA member to access the page). That page includes a discussion of the FARs, many common scenarios that spark debate, and links to additional resources that can help pilots and CFIs fill out their logbooks correctly and ensure that they meet the requirements for certificates and ratings and recent experience. Logging Instrument Approaches as a Flight Instructor here at BruceAir. To read the FAA’s interpretations on the relevant regulations, visit and read the letters of interpretation on this topic from the office of the chief counsel, here. By the way, the AOPA page also discusses electronic logbooks. The FAA has issued an advisory circular (AC 120-78: Acceptance and Use of Electronic Signatures, Electronic Recordkeeping Systems, and Electronic Manuals) that provides guidance for pilots, maintenance technicians, and others who must keep records required by the FARs.